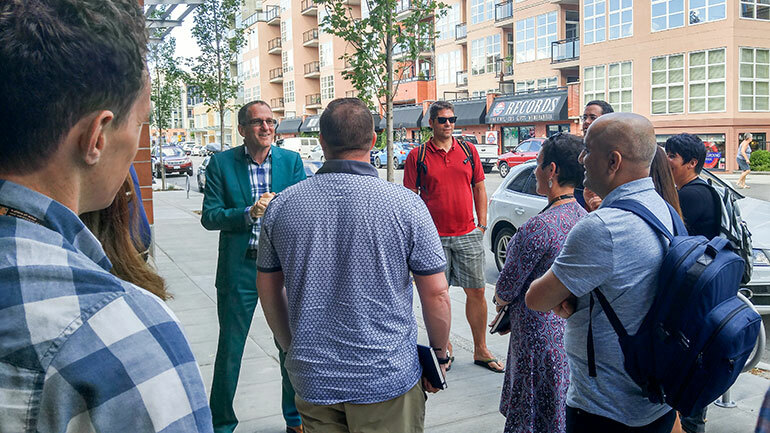 Master of Management students tour downtown Kelowna with City of Kelowna Director of Business and Entrepreneurial Development Robert Fine as part of their two week-long summer intensive. Professional graduate education is being reimagined right now at UBC’s Okanagan campus. The Faculty of Management welcomed its first cohort of students into its Master of Management (MM) program this week. The 25-month, part-time program is designed to be accessible for working professionals from any sector worldwide, and is delivered through a blend of online and in-person learning. The program launched in June with initial readings and online discussions around topics such as leadership, sustainability, globalization, competitiveness, and problem-based learning, building up to the first “intensive in-residence” session. The first intensive in-residence session has included field studies with organizations throughout the Okanagan, involved in wine, research and development, health, technology, forestry, government, First Nations, and the food and beverage industry. Students come from a variety of regions including: Japan, Pakistan, Ontario, Alberta and British Columbia. Their professional backgrounds include areas such as engineering, education, entrepreneurship, technology, health, finance, tourism and operations. Instructors also bring a diverse range of expertise to the program, coming from UBC’s Faculty of Management, Faculty of Education and Department of Psychology, as well as international partners at the KEDGE Business School in Bordeaux, France, and Orkestra-Basque Institute of Competitiveness in San Sebastián, Spain. To learn more about the program, visit mm.ok.ubc.ca.